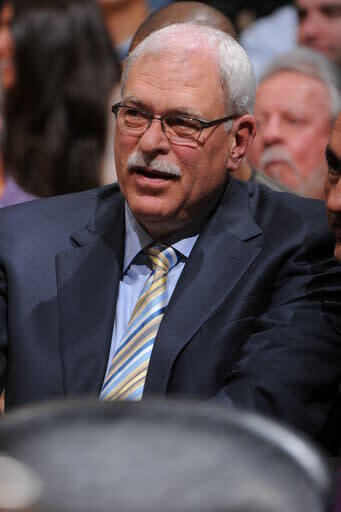 Phil Jackson has rejected the Brooklyn Nets' overtures to take over as coach, a league source told Yahoo! Sports. Nets general manager Billy King talked with Jackson on Tuesday, and Jackson, the 11-time champion coach, reaffirmed his desire to pursue a broader front-office role over coaching in his return to the NBA. Mikhail Prokhorov, the Nets' billionaire owner, was believed to be prepared to make Jackson the highest-paid coach in team history. Jackson is consulting with the Detroit Pistons on their coaching search, and could ultimately receive an offer from the Toronto Raptors to run that organization. The Nets had waited for a response from Jackson before embarking on their coaching search, and now will soon start reaching out to candidates. The Nets lost in seven games to the Chicago Bulls in an Eastern Conference first-round series. The New York Post first reported Jackson's decision with the Nets. • Did Tony Romo cut back on golf as part of a 'work like Peyton' mandate?